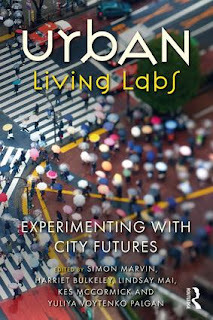 Urban living labs: Conducting the experimental city? The recent upsurge of interest in the experimental city as an arena within and through which urban sustainability is governed marks not only the emergence of the proliferation of forms of experimentation – from novel governance arrangements to demonstration projects, transition management processes to grassroots innovations – but also an increasing sensibility amongst the research community that urban interventions can be considered in experimental terms. Yet as research has progressed, it has become clear that experimentation is not a singular phenomenon that can be readily understood using any one conceptual entry point. In this paper, we focus on one particular mode of experimentation – the urban living laboratory (ULL) – and develop a typology through which to undertake a comparative analysis of 40 European ULLs, to understand how and why such forms of experimentation are being designed and implemented, and to identify the particular forms of experimentation they entail. We argue that there are distinct types of ULL taking shape, delimited by the ways in which they are designed and deployed through, on the one hand, specific kinds of configuration and practice and, on the other hand, by the ways in which they take laboratory form: the different dispositions towards the laboratory they entail. We propose three ‘ideal’ ULL types – strategic, civic and organic – and argue that these can be placed along the spectrum of four dispositions: trial, enclave, demonstration and platform. Urban Living Labs (ULL) are considered spaces to facilitate experimentation about sustainability solutions. ULL represent sites that allow different urban actors to design, test and learn from socio-technical innovations. However, despite their recent proliferation in the European policy sphere, the underlying processes through which ULL might be able to generate and diffuse new socio-technical configurations beyond their immediate boundaries have been largely disregarded and it remains to be examined how they contribute to urban sustainability transitions. With this study, we contribute to a better understanding of the diffusion mechanisms and strategies through which ULL (seek to) create a wider impact using the conceptual lens of transition studies. The mechanisms of diffusion are investigated in four distinct ULL in Rotterdam, the Netherlands and Malmö, Sweden. The empirical results indicate six specific strategies that aim to support the diffusion of innovations and know-how developed within ULL to a broader context: transformative place-making, activating network partners, replication of lab structure, education and training, stimulating entrepreneurial growth and narratives of impact. Experimentation as a means of governance for sustainability transitions has been advocated for years by transition scholars and geography scholars. We propose that examining the impact of experimentation requires an understanding of its embeddedness in place as a socio-spatial context. This notion of embeddedness, which conceptually aligns well with the understanding of sense of place, is under-examined in sustainability transitions literature. By conjoining the sense of place and sustainability transition literatures, we conceptualize that sense of place can be one outcome of experimentation fostering sustainability transitions. We examine urban living labs as an open format of urban experimentation, where multiple actors interact with the aim to co-design, test, and implement governance innovations. From the literature, we have distilled three phenomena that relate to a sense of place as mechanisms for transformation: a symbolic understanding or meaning of place; a narrative of place that connects to a transformative vision; and new types of relations between people and place. With this conceptual lens, we analyze our case study, an urban living lab called The Resilience Lab in a neighborhood of the city of Rotterdam, The Netherlands. Drawing from a longitudinal case study research, we contend that urban living labs can connect a sense of change (transformation) with a sense of place by co-creating new narratives of place, by co-producing knowledge on new practices and new relations between people and place, and by allowing the co-design or (re)establishment of places with symbolic meaning. As such, urban living labs facilitate urban sustainability transitions. All cities face a pressing challenge – how can they provide economic prosperity and social cohesion while achieving environmental sustainability? In response, new collaborations are emerging in the form of urban living labs – sites devised to design, test and learn from social and technical innovation in real time. The aim of this volume is to examine, inform and advance the governance of sustainability transitions through urban living labs. Notably, urban living labs are proliferating rapidly across the globe as a means through which public and private actors are testing innovations in buildings, transport and energy systems. Yet despite the experimentation taking place on the ground, we lack systematic learning and international comparison across urban and national contexts about their impacts and effectiveness. We have limited knowledge on how good practice can be scaled up to achieve the transformative change required. This book brings together leading international researchers within a systematic comparative framework for evaluating the design, practices and processes of urban living labs to enable the comparative analysis of their potential and limits. It provides new insights into the governance of urban sustainability and how to improve the design and implementation of urban living labs in order to realise their potential. Innovations in urban governance such as Urban Living Labs (ULL) are expected to accelerate the transition towards more sustainable and climate-resilient cities. This article reviews different ULL across Europe and explores the role and potential capacity of municipalities in the development of and/or facilitation of ULL as a form of experimental governance. It focuses on the role of the public sector in the multi-actor collaborations that often characterize experimental governance. The article draws on literature on cities in sustainability, climate and environmental governance, and bridges this with political science literature on governance. Based on institutional theory that emphasizes roles, identities, and perceived and actual acting space, three functional roles for the municipality are singled out – promoter, enabler and partner – in a framework with a set of indicators that are used to analyse 50 case studies of ULL. The aim is to advance knowledge on how municipalities can facilitate urban sustainability through experimental governance. Urban living labs (ULLs) offer opportunities to foster sustainability in cities. They are sites to design, test and learn from innovation in real time. A key element in the operation and success of ULLs is user involvement. Users are often viewed as co-creators who shape ULL outcomes by contributing with their knowledge and experi ence. The transformative potential of ULLs for sustainability is often interconnected with user participation. Despite its importance, user involvement in ULLs remains a practical challenge that is also understudied. In this article, we examine how ULLs engage in a participatory methodology that facilitates co-creation with users, and discuss the link between user involvement and the transformative potential of ULLs. While co-creation is a cornerstone of the ULL concept, we also show that a combination of different user participation levels in different stages of the ULL life cycle has a potential to enhance the outcomes and transformative potential of ULLs. User involvement plays a positive role in realising the transformative potential of ULLs for sustainability, but governance structure, leadership and power distribution are also important factors for ULLs to become transformative.